Massive Volcanic Eruption In Indonesia Blankets Region In Ash : The Two-Way Mount Kelud blasted volcanic soot 12 miles into the air on the island of Java as it erupted, killing several people and forcing the evacuation of tens of thousands. 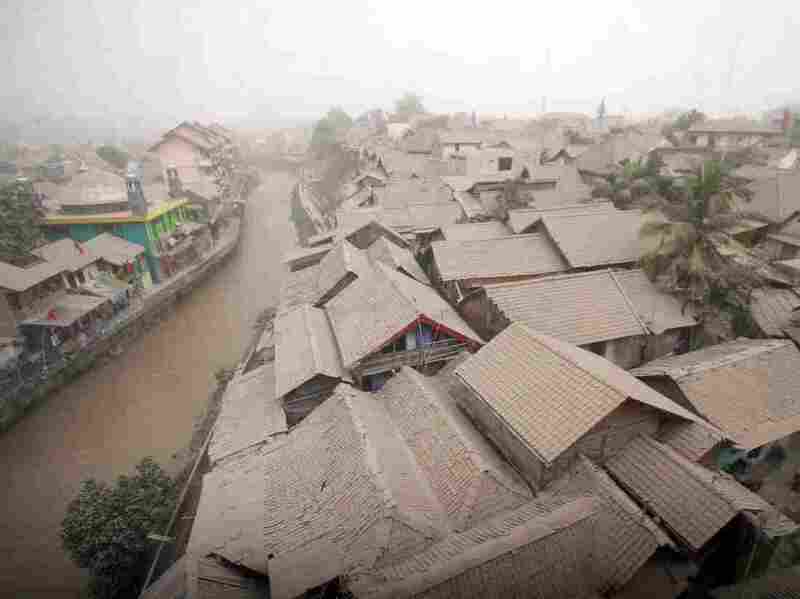 A residential area is covered with ash from the Mount Kelud volcano, in Yogyakarta, Indonesia, on Friday. The second major volcanic eruption in as many weeks in Indonesia has killed at least three people and forced the evacuation of tens of thousands on the island of Java, as Mount Kelud spewed ash and debris 12 miles into the sky. Thursday night's eruption of the volcano, located 50 miles southwest of the country's second-largest city of Surabaya, could be heard up to 125 miles away, Indonesia's disaster agency says, according to The Associated Press. Ratno Pramono, a 35-year-old farmer, tells the AP that the eruption "sounded like thousands of bombs exploding." "I thought doomsday was upon us. Women and children were screaming and crying," he says. 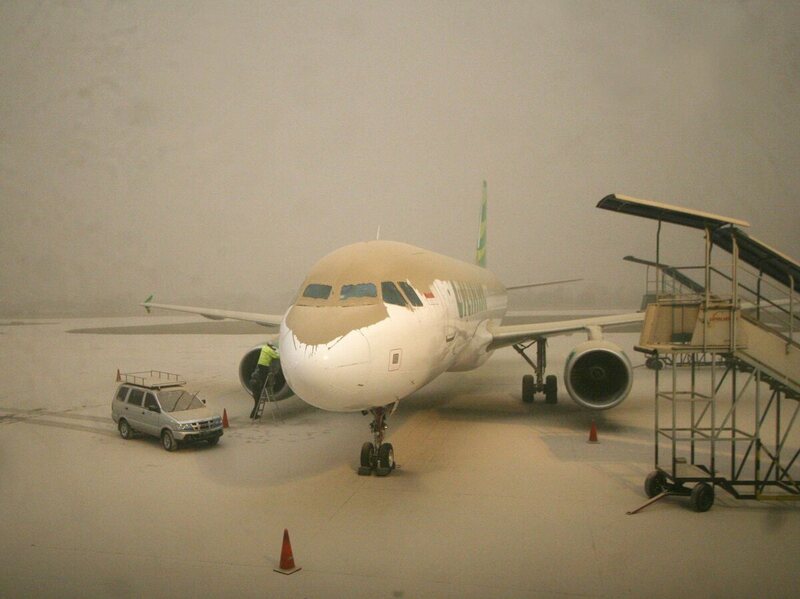 Indonesian workers check a Citilink airplane covered with ash from Mount Kelud at Adisucipto International Airport in Yogyakarta, Indonesia, on Friday. The eruption has forced seven of the region's airports to close. The eruption forced the seven airports to close because of reduced visibility from airborne ash and the danger the ash poses to aircraft engines. Thousands of passengers were stranded. "Based on verified data, over 76,000 people have been evacuated from five cities around the volcano ... and about 200,000 people were affected," National Disaster Mitigation Agency spokesman Sutopo Nugroho said in a text message to Reuters. The AP puts the number of evacuees at 100,000. Australian Network News quotes Nugroho as saying people living within a 6-miles radius of Kelud had been asked to leave mere hours before the eruption. He says a rain of ash, sand and rocks is falling on an area stretching 10 miles from the volcano's crater, according to the Australian news agency. "Sparks of light can be continuously seen at the peak," he says. Nugroho says the eruption has left up to 2 inches of gray ash on roads and buildings as far away as Yogyarkarta, 135 miles west of the eruption. "The 5,680-foot-high Mount Kelud in eastern Java — Indonesia's most densely populated island and home to more than half of the country's 240 million people — has been rumbling for several weeks and was under close observation. The mountain is about 600 kilometers (373 miles) east of Jakarta, the capital." Early this month, another volcano, the 8,530-foot Mount Sinabung in western Sumatra, erupted, killing at least 14 people, and last year, six people were killed in an eruption of Mount Rokatenda on the tiny Indonesian island of Palue. In 2010, 324 people died in a two-month-long eruption of Mount Merapi. Indonesia is one of the world's most geologically active regions and sits along a region known as the Ring of Fire that encircles the Pacific Ocean. It is prone to frequent and sometimes violent earthquakes and volcanic eruptions.